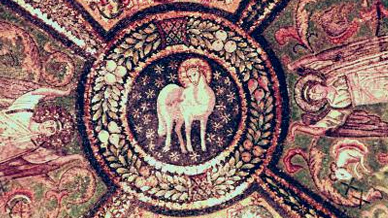 Byzantine art is a stylized, religious art form, distinguished by its naturalism, and by a rejection of the ordinary in favour of the extraordinary. 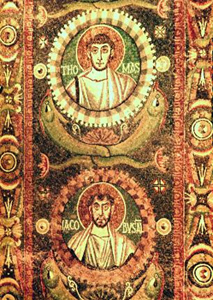 The wide social gulf between lay and church leaders on the one hand and the people on the other was evident in Byzantine art. Intricate aesthetic detail is paramount: in architecture, outer walls are made to look like thin curtains and topped by a dome, an emblem of perfection, while interior walls are lavishly encrusted with marble and gold. Byzantine aesthetics exemplify a culture based on the unchanging laws ot a Christian universe, but always with an attention to detail and ornamental finery. The greatest monument of Byzantine architecture is the Hagia Sophia, or church of Divine Wisdom in Constantinople. Built between ad532-537 under the rule of Justinian, it replaced a more modest church that was destroyed by fire. 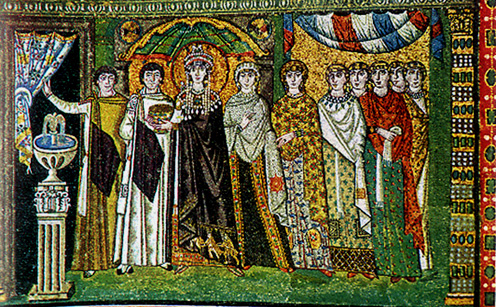 The sixth century was seen as the first "Golden Age" of Byzantine art. At this time, mathematics was regarded as the highest of the sciences, and one of the architects of the Hagia Sophia, Anthemius of Tralles. described architecture as the "application of geometry to solid matter". The interior of the church shows a rejection of homogeneity and. in its place, exists a luxurious, exotic diversity. It contains columns of green marble (from the temple of Artemis at Ephesus), of porphyry (possibly from the temple of Zeus at Baalbek), and of granite (from Egypt), and the walls are lined with coloured marble. A lively mosaic of the figures of Justinian and Constantine adds to the splendour conjured up by the play of sunlight on the interior. The vastness of this imperial, mystical building contrasts with the more sober buildings of public worship in Rome. Constantine VII, himself a sculptor and writer, came to power in 945 and was emperor of the Byzantine Empire at the height of its glory. In his De Ceremoniis he describes court life and gives an idea of what the ancient imperial palace looked like. It bore no resemblance to the great residences of Rome, which comprised one building with gardens and pavilions, but was a complex of buildings of every kind - religious and secular - with its own harbour and courts. It was influenced by Eastern palace designs. The many rooms were notable more for their furnishings and ornamentation than for their structure. However, the palace did contain mosaics that continued the classical tradition, portraying pastoral, non-religious scenes. 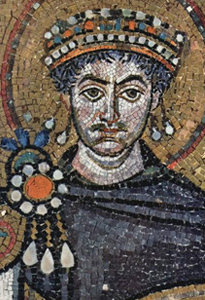 From Constantinople, Byzantine art spread through northern Europe. The Vikings, or "Rus", who ruled the people of Russia and traded with the Byzantine Empire by ship, took Byzantine art with them when they returned to their lands, the influence lasting there until today. 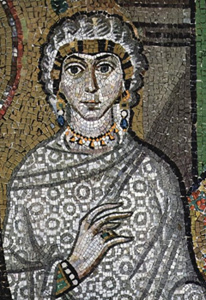 The frescos and mosaics of true Byzantine art show a break with the classical tradition, as does the painting. The individual elements are suggested by shapes that are almost hieroglyphic; scenes are usually shown without perspective, there is a code of repetitive poses and gestures (figures and forms are often stylistic or ritualistic), and the emphasis on outlines echoes the "barbarian" taste for linear definition. Areas of empty space are often represented in gold. Unlike the Christ of Western art, the Christ of Byzantine art is portrayed as awesome, and is similar to the Jehovah of the Old Testament. 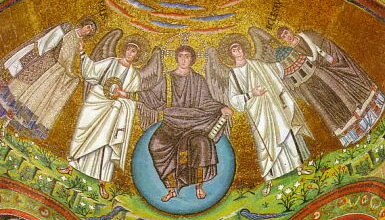 The golden circle adopted from the sun kings of the East was transferred to Christ, and became the medieval halo. In 1204, the Crusaders left the city of Constantinople in ruins. The glorious Eastern Empire of the Romans dwindled, but its influence remained in the art of the region for centuries to come. Marble capital with horses, San Vitale, Ravenna, Italy, sixth century. 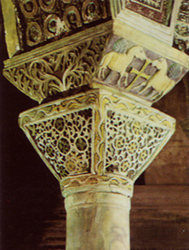 Typical Byzantine capitals such as this gradually developed from the earlier Hellenistic-Roman designs. The characteristic abstract surface design is achieved by a combination of fretwork and the repetitive patterns of the acanthus leaves. Apse mosaic of the theophany. 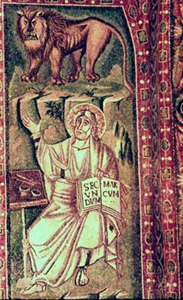 Christ as cosmocrator sits on the sphere of the cosmos. Saints, including Saint Vitalis and Archbishop Ecclesius and a donor are being welcomed into the celestial garden of Paradise. 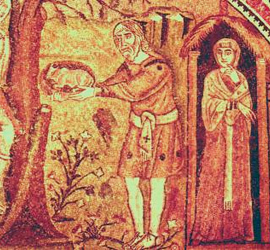 Detail from this group showing the Hospitality of Abraham. While proportions are hieratic, Abraham's wife has an expressive gesture. 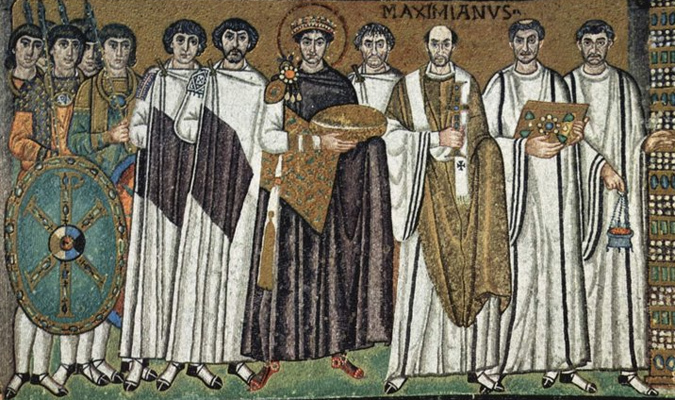 Wall mosaic, Justinian and His Attendants, San Vitale, Ravenna, Italy, c.546-47. Suspended in a golden space and identical in posture, the figures are individualized by their faces. The emperor is identified by emblems of rank, including the red footwear, the three-pendant fibula, the diadem, and the halo. 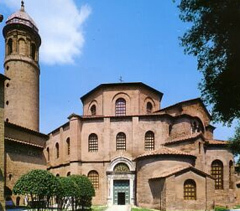 San Vitale, Ravenna, Italy, c.546-47. The Basilica of San Vitale is the most famous monument of Ravenna, Italy and is one of the most important examples of Byzantine art and architecture in western Europe. 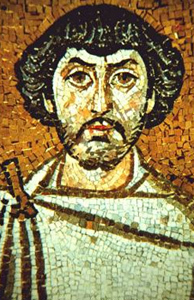 It was begun by Bishop Ecclesio in 527, and completed by the 27th Bishop of Ravenna, Maximian in 548 during the Byzantine Exarchate of Ravenna. 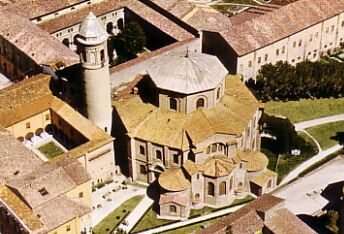 The building combines Roman elements (the dome, shape of doorways, stepped towers) with Byzantine (polygonal apse, capitals, narrow bricks, etc). However, the Basilica is most famous for its wealth of Byzantine mosaics, the largest and best preserved outside of Constantinople itself. 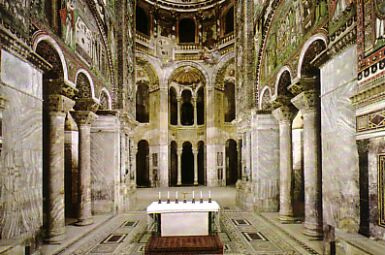 The church is of extreme importance in Byzantine art, as it is the only major church from the period of Emperor Justinian to survive virtually intact to the present day, and it is also thought to reflect the design of the Byzantine Imperial Palace Audience Chamber, of which nothing at all survives. 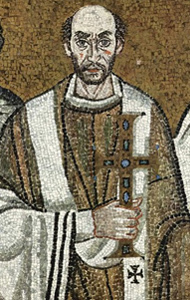 The construction of the church was sponsored by a Greek banker, Julian the Silversmith, of whom very little is known, except that he also sponsored the construction of the Basilica of Sant' Apollinare in Classe at around the same time. Here is an example of the "Inspired Evangelist" iconographic theme. Each Evangelist has a set of associated symbols. 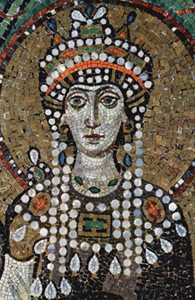 Head of the Empress Theodora. Mosaic of the "tent of heaven." Orant angels support the Lamb Triumphant surrounded by garland of four seasons which suggests Paradise. The classical acanthus is handled naturalistically, and the symbols are concrete. The Lamb is on a blue rather than gold ground. Medallions with portraits of the Apostles Thomas and Jacob from a set of twelve apostles on the underside of an arch.